So how can you find out where a lead came from? One way is to have them answer “How did you find us?”. But many people don’t answer it, either because they don’t want to or they forget where they found you first. You can also get this information by configuring goals/conversions in your favorite analytics tool, let’s say Google Analytics. Your reports then tell you where the most conversions came from. However, there’s one drawback of this approach. You get this information in aggregate. You can’t look at a subscriber and tell where they came from. 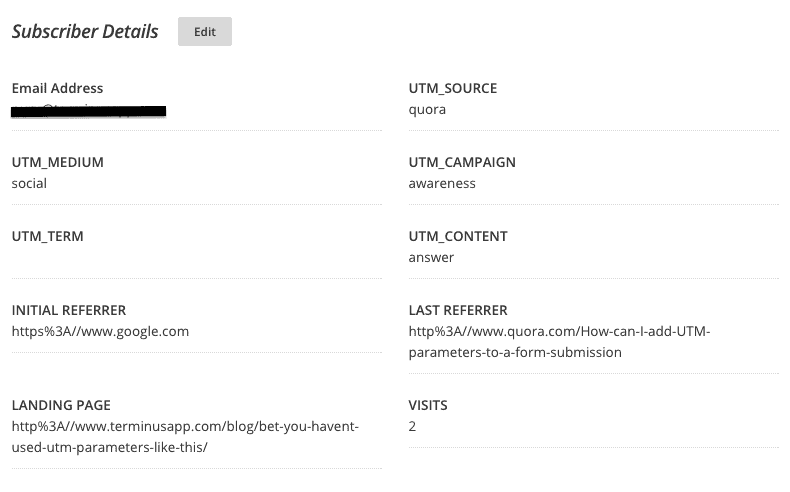 Let’s discuss a simple technique to capture UTM and Referrer information along with your lead generation forms. I covered a basic version of this in another post. The technique discussed here is simpler and more powerful than the old one. I might be duplicating some parts from the old post, but it’s better to have everything in one place. How to do this for Mailchimp? Go to your subscribers list. Select List fields and *|MERGE|* tags from Settings. Click Add A Field, select text. Add “UTM_SOURCE” for Field Label and “USOURCE” for Put this tag in your content. Make sure Required? and Visible? are unchecked. Also repeat it for IREFERRER, LREFERRER, ILANDPAGE and VISITS as shown in the above image. Just add this before the closing </body> tag at the bottom of every page on your website. It’s that simple. You could either make a change directly to your website or use Google Tag Manager for this. NOTE: The script will be loaded from Terminus CDN and I’ll pick up the tab for your traffic. However, I don’t provide any guarantee that this will always be available. To be safe, you could host it yourself. So what information will you be able to capture about your leads/subscribers? All of this information is saved in a cookie. So it doesn’t matter if a visitor navigates to different pages on your website before filling your form. This information is added to the lead form in all the cases. How does a subscriber look like in Mailchimp? As you can see, this subscriber initially came to Terminus from Google (Initial Referrer) and then later from Quora by clicking on a UTM tagged URL. I also know the exact question (Last Referrer) they saw on Quora. The visitor converted on their second visit (Visits). Additionally, I know they initially landed on a blog post (Landing Page) on Terminus. The visitor was probably searching for some UTM related information on Google and landed on Terminus. They then went to Quora looking for similar information. They again found Terminus mentioned there, came back to Terminus blog and converted. Now I know that the combination of SEO and answering Quora questions is working. And I know this without getting lost in multi-attribution reports. I’m sure you can use this information in various innovative ways and get some unique insights about your leads. Since this information is attached to each lead/subscriber, you can move it between different CRMs or email service providers. It’s not tied to any analytics tool. You can also export it to any spreadsheet and analyze it. NOTE: If you want to take your UTM tracking to the next level, sign up our FREE email course: Learn the Best Practices for Building UTM Tracking URLs. What if I have some advanced needs? 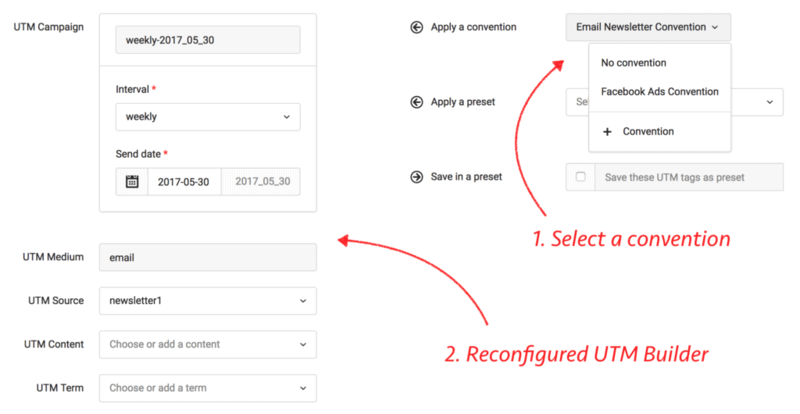 You may want to change the default values of UTM Form script if your setup is a bit complex. You can easily configure it for the most common cases. Change example.com to your domain name. If you don’t like the default form field values (i.e. USOURCE, UCAMPAIGN, IREFERRER, etc. ), you can specify them as well. Besides these, there are a bunch of other configuration options that can help with your particular needs as well. _uf.form_query_selector = 'form[action="/sign_up"]'; // custom form selector. Default is 'form', to select any form. Do you want to look at the code and play with it? Awesome. The code is open sourced at Github. It also has some more detailed information about what happens when you add this script. If you can improve it, just send a pull request and I’ll be happy to merge it if looks good. You can now capture a lot of valuable information about your visitors, especially where they are coming from. Get the power of expensive analytics tools without the expensive part. Sometimes looking at each person individually gives you much better feel about them, what they are looking for, how they found your site, etc. It’s much better than treating them as a point on your chart. 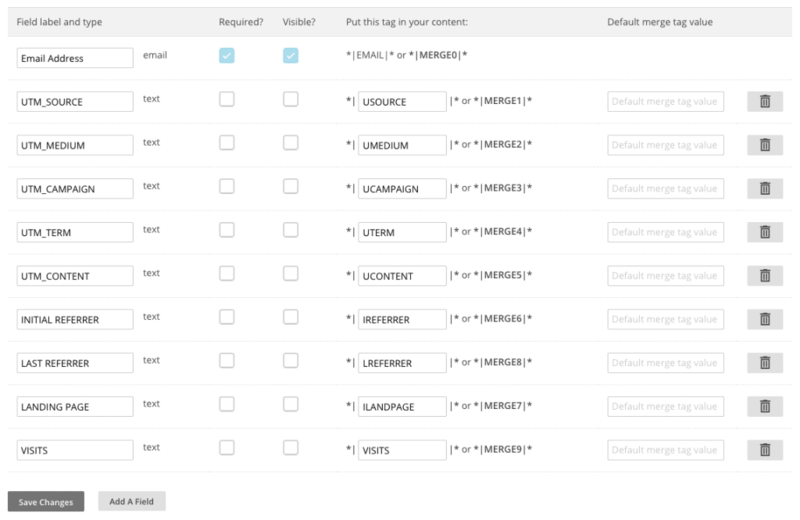 Capturing UTM parameters in your lead forms is only one small part of your tracking.